On-location filming in Greater Los Angeles rose 3 percent in the third quarter of 2018, according to the latest update from FilmL.A. In all, 9,734 “shoot days” were logged during the period, including all filming categories tracked by the nonprofit organization. On-location Feature production is up for a third consecutive quarter. 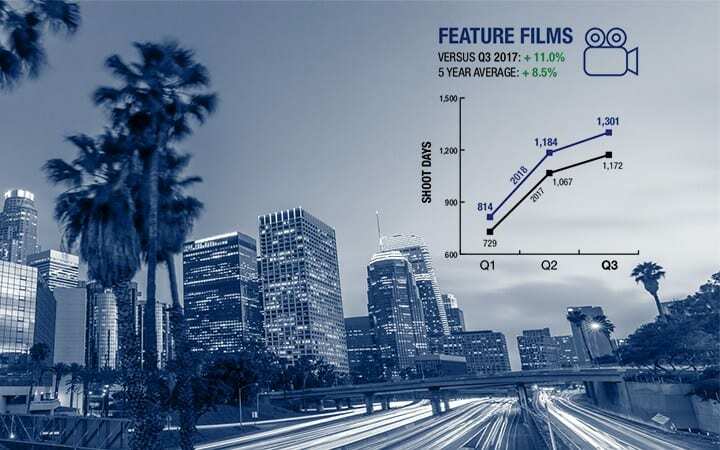 Incentivized projects brought to Los Angeles by the California Film & Television Tax Credit Program contributed 15.1 percent or 197 of the 1,301 SD in the Feature category. The Television category overall saw and overall increase of 1.8 percent to 4,095 SD in the third quarter. Much of the jump in the TV category was attributed to the TV Dramas category which leapt 21.6 percent for the quarter. Increases were also seen in TV Pilots (up 30 percent to 78 SD), TV Reality (up 5.5 percent to 1,127 SD) and the “Other” category, that consists largely of still photo shoots, student projects and music videos (up 0.4 percent to 2,938 SD). A decline was also seen in Web-Based TV (down 32.1 percent to 976 SD), a category comprised primarily of short-form content.